Volphone's reverential prayer to his heaps of gold launches the sharpest, funniest play about money and morals in the 17th century - a play still wickedly relevant on the same topics four centuries later. Ben Jonson's comedy depicts selfishness thinly veiled by sanctimonious speeches, lust and possessiveness poorly disguised as love and marriage, and cynical legalism passing itself off as pure justice, alongside snobbery, class warfare and greed. The wily protagonists keep a dozen conventional plots spinning in the minds of their dupes, and when their amazing juggling act finally unravels, there are yet more twists - and an even deeper cynicisim - to the story. 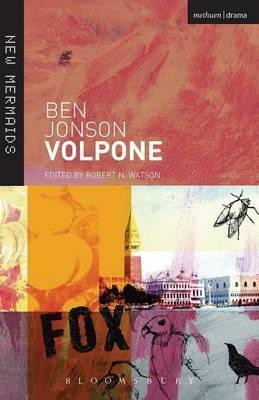 The play is partly a beast-fable: the wily fox, Volpone, plays dead to lure flesh-eating birds that he can then consume. But the beasts are the human race, and polite society the biggest, greediest scam of them all. This student edition contains a lengthy Introduction with background on the author, date and sources, critical interpretation and stage history. Robert N. Watson is Distinguished Professor of English at UCLA. His publications include Critical Essays on Ben Jonson (as editor) and Ben Jonson's Parodic Strategy. He also edited the New Mermaids edition of Every Man in His Humour.